Earn up to 825 reward points. High-quality passive magnetic soundhole pickup for use with any dual or multi-source system. In keeping with its name, The Black Angel, a passive magnetic soundhole pickup, is matte black in color. Like The Angel, The Black Angel "hears" the entire range of the acoustic guitar from top to bottom, with no gaps anywhere. Its "feel" is just as important. The Black Angel tracks right- and left-hand dynamics, and responds immediately to the sound coming off the string. The Black Angel is quiet and, although it's magnetic, it doesn't sound electric - there's no hum and no battery. Both coils are on a parallel axis to the strings, featuring a humbucking magnetic circuit that is acoustically isolated to reduce unwanted finger and pick noises. Players who like to mix two or more pickups together will appreciate the built-in phase switch making The Black Angel ideal for use in any dual or multi-source system, and it can be easily combined with any piezo or microphone. The Black Angel installs easily and quickly in the soundhole, with no modification to your guitar, and fits soundholes of 3-1/2" (89 mm) and larger. The 2-1/16 "E"-to-"E" string spacing on The Black Angel easily accommodates guitar nut dimensions ranging from 1-11/16" to 1-3/4". Both a 1/8-inch to 1/4-inch Switchcraft endpin jack (install version) and a quick mount 10-foot cable (standard phone jack) are included with The Black Angel. 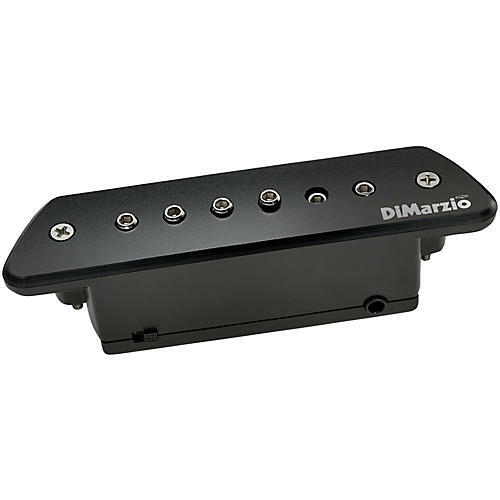 Top Dimensions: 4.26" x 1.06"
Give your guitar an upgrade with this DiMarzio pickup. Order today!